My Academic Research is in Geoscience Education. What Do Undergraduates’ Perception of the Relevance of Geoscience and Society Have In Common with The Human-Earth Related Earth Science Literacy Principles? Students Identify Certain Topics as Applicable for Decision-making for a More Sustainable Future. Abstract: The role geoscience plays in the sustainability of the planet is obvious to geoscience experts and educators who have a firm grasp of topics such as water systems, formation of fossil fuels and plate tectonics. However, do undergraduates perceive geoscience as relevant for a more sustainable future? Furthermore, if students recognize geoscience content as relevant? Do they foresee how to apply the information in a societal context? Qualitative data (in the form of open-ended responses) were collected over the course of a semester in an active-learning introductory geology course. Course structure, instructor pedagogical practices and student demographic profile characteristics were described. A repeated short-answer question was administered online at the end of each module and a different short-answer question completed on the final exam aimed to capture students’ perception of the relevance of geoscience in society and for decision-making for a more sustainable future. The Earth Science Literacy Principals (ESLPs) human-Earth related Big Ideas served as a guide to characterize student responses. Analysis of repeated open-ended responses (n=238) showed that students placed a greater emphasis on some geoscience concepts as more relevant to society than others. The geoscience concepts students described as relevant were similar to the human-Earth related concepts stated in the ESLPs. Topics identified as most relevant included natural hazards, water and energy resources and climate change. Student responses on the final exam (n=75) revealed the link between perception of relevance of geoscience content and the ability to make sustainable decisions for the future. This study indicates that undergraduates are cognizant of the connection of geoscience and a sustainable society. I worked with AGI to demonstrate the effectiveness of a Next Generation Science Standards Summit, which was funded by the National Science Foundation. My role was to record the conversations of the artifacts of the summit. I like to design research that will allow me to collect data that can be organized in excel, used in statistical software and then displayed in meaningful ways. few of my products are shown here. Each node represents a participant and each line represents a mutual acknowledgement that a both participants reported they knew how to collaborate with EACH OTHER on a specified INITIATIVE. Thesis Title: What do Students Find Relevant in an Introductory Geology Course? Implications for Changing Students’ Attitudes About the Relevance of Geoscience in Society. Abstract: Geoscience education plays a vital role in achieving the goal of cultivating a scientifically literate citizenry that can make informed decisions for a sustainable future. This study investigated undergraduates’ attitudes about and perceptions of the relevance of geoscience in society. Using a mixed-methods approach, data were collected over the course of a semester in an active-learning introductory geology course. Course structure, instructor pedagogical practices and student demographic profile characteristics were described. Students’ (n=144) attitudes in three sections of MEA 101 were quantitatively measured with the Changes in Attitudes about the Relevance of Science (CARS) instrument. No significant difference in students’ attitudes about the relevance of science among sections was found. Statistical analysis provided evidence that students’ average CARS scores significantly increased (p=0.018) over the course of the semester. This signified that students were increasingly more agreeable to statements about the application of science in daily decision-making. Students’ change in CARS scores showed a significant positive relationship with two of the three performance measures. The strongest relationship (R2=0.16, p<0.001) was with a short-answer score that assessed students’ ability to describe the application of geoscience content in society. Qualitative data from open-ended questions provided insight into students’ perceptions of the relevance of geoscience in society. Analysis of responses showed that students identified similar geoscience concepts relevant to society as described by the Earth Science Literacy Principles human-Earth related Big Ideas. These concepts included topics related to natural hazards, water and energy resources, and climate change. Student responses revealed the link between perception of relevance and application of the geoscience content in a real-world situation. Starting to flip the class: Quality of student’s pre-class work improves with the use of online Just-in Time Teaching methods. Many instructors seek to encourage their students to become familiar with class content by completing reading assignments before entering the classroom. However, motivating students to complete such reading assignments is often a challenge. 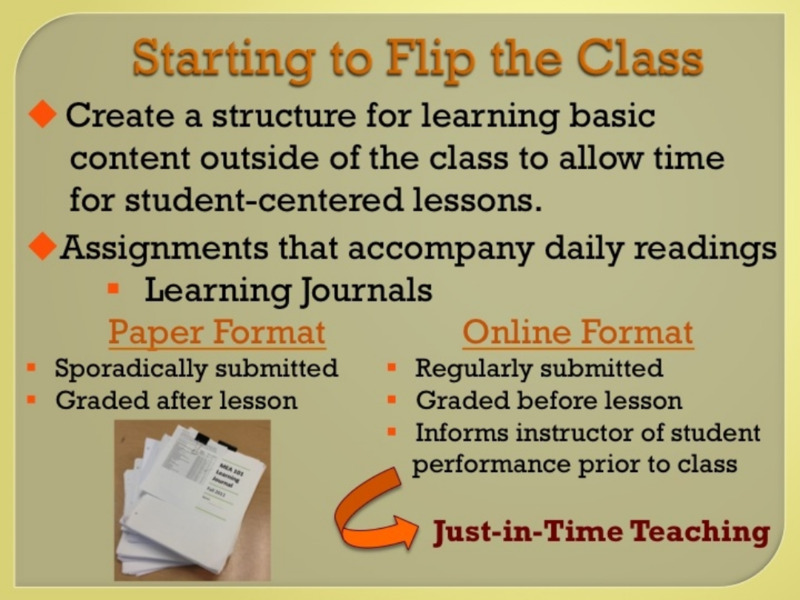 Careful design of pre-class reading assignments in combination with in-class activities dedicated to confronting more challenging concepts has been described as an inverted or flipped classroom. This instructional model has recently received considerable attention among college educators. As an incentive for students to better prepare for lecture, instructors in introductory geology classes at North Carolina State University have implemented a partially flipped class structure using daily pre-class learning journals (LJs). Students responded to entries that included a variety of forms of questions focused on concepts from assigned reading. Initially LJs were completed on a hardcopy (paper) and intermittently collected and graded. This format was similar to a homework assignment with students responsible for keeping pace with the syllabus. The second half of the study shifted to an online version where the LJs were submitted and graded the evening before each lecture, similar to Just-in-Time Teaching (JiTT) model. Data was collected from students (N=189) over the span of four semesters. The sampling frame from each semester was stratified according to students’ end of semester grade. Students were randomly selected from those who earned an A, B, or C. A three-part rubric (i.e. articulation, appropriate content, and accurate explanation) was developed to evaluate the quality of short answers. Average rubric scores for the online LJs were higher than those completed on hardcopy. Three of four questions selected for assessment showed statistically significant improvement in the online format. The average number of words written online was significantly higher for all questions (p≤0.001). Students wrote approximately 50% more words when completing LJs with the online version. Linear regression between number of words and score indicated moderate correlation (r2=0.21, p< 0.001). Findings support the use of structured pre-class activities through the use of an online classroom management tool as an effective way to better prepare students for lecture.